Deeply embedded in real estate agent training and development literature is the directive to be constantly engaged in lead-generation activities. Lead-generation is an essential function for all salespeople, and is a particularly proactive approach real estate agents can use to build a strong network of prospective business relationships. Based on experience and personal preference, each agent will have his/her opinion on which lead-generating mechanisms work most effectively. Some will argue that investing in direct mail advertising is more effective than Internet-based advertising. Some will argue that holding open houses has a greater impact than calling on expired listings. Most will argue that a mix of a number of activities will produce the strongest lead-generating outcomes. While most agents will defend the effectiveness of each these activities at some level, though, the value and effectiveness of cold calling might spark the most heated debate among lead-generation-active agents. Although some agents swear by the effectiveness and legitimacy of the cold call, others have a much more negative view of this traditional approach. A lack of empirical data on the efficacy of cold calling only promotes the continual back-and-forth debate, as most arguments for or against the practice lean solely on unsupported, anecdotal data. In the fall of 2011, Baylor University's Keller Center for Research and a team of Baylor MBA students partnered with the research and development department at Keller Williams Realty International (KWRI) to begin to quantify the importance and effectiveness of cold calling as a prospecting tool. Specifically, the study sought to measure the effectiveness of the toughest, true cold call - a totally unqualified list. The study reveals that agents willing to invest the time, energy and resources into cold calling may reap the available prospecting benefits that many agents have written-off. Cold calling, for the purpose of this study, is defined as calling a random set of numbers from a region not previously marketed to by the agent. Ten KWRI "Team Leaders" (local KWRI agency leaders, focused on growing their agents' businesses and market centers through coaching, consulting and training) were recruited to the study and represented each of the four contiguous U.S. time zones (EDT, CDT, MDT, PDT). Each of the ten Team Leaders were asked to commit 16 agents from his/her region to participate in the study, yielding a target participation of 160 agents from across the country. Each recruited agent was provided with a standardized cold calling script and committed to set aside an hour each day for seven days over a two-week period to make cold calls in his/her respective geographic region. The script was developed with the assistance of the KWRI training department and though a focus group conducted with some of Texas' most productive KWRI agents. Agents were asked to call a generic, random list of numbers from a region not previously marketed to that either they provided or that was supplied to them by their KWRI regional office. Calls were to be placed for an hour at a time, and were to be completed at a different hour on each day of the study (e.g., an agent would call for one hour beginning at 10:00 AM one day, then for one hour beginning at 11:00 am the next, at 12:00 PM the next day, and so forth). Of the 160 agents recruited, 50 completed the full seven hours of telephoning required. Over the course of a two-week period in November 2011, 50 participating agents made 6,264 phone-based cold calls, collectively. Of the 6,264 cold calls placed, 28% were answered, 55% were not answered, and 17% were non-working numbers. While 6,264 calls were placed over the seven-day period, 72% were very quick calls due to non-answers and non-working phone numbers. Accounting for non-answers and non-working numbers becomes the tedious part of working true cold calling lists. However, the 28% of calls that were completed (1,774) were productive calls. Out of the 1,774 calls that were answered, agents were able to set a total of 19 appointments with prospective clients, and 11 referrals were received. Agents were asked to call back at a later time by 132 prospective clients, and 1,612 of the callees were not interested in the offering or refused additional information. Realistically, the average agent will not be willing to make 6,264 cold calls to achieve outcomes similar to this study. So, the question becomes, "What must I do to achieve a positive return from my cold calling efforts?" If we assume that the goal of cold calling is to either set an appointment or receive a referral, then the data help to tell a story of what Return on Investment (ROI) agents might realistically expect to achieve from cold calling. The study reveals that for every 330 calls made, approximately one appointment was set (a 330:1 call-to-appointment ratio). More relevant to our desired cold calling goal, for every 209 calls made, one appointment was set or referral was received (a 209:1 call-to-appointment-or-referral ratio). If we consider that the study indicated 72% of calls made were bad (non-answers or non-working numbers), then approximately 150 of every 209 calls will be bad. Assuming that placing a bad call takes about 1 minute per call (on average), then 150 minutes (or 2.5 hours) will be spent handling bad calls. Consider also that the study indicated 28% of calls made were answered. Consequently, 59 of every 209 calls will be answered. If we assume that an answered call takes approximately 5 minutes to complete (on average), then 5 hours will be spent handling answered calls. Collectively, we see that it will take an investment of approximately 7.5 hours to complete 209 calls, leading to a return of one appointment or referral. If calls are broken-out across one work-week, agents can expect to make 1.5 hours worth of calls each day for 5 days to secure one appointment or receive one referral - a positive cold calling outcome. 7.5 hours invested to achieve 1 qualified appointment or referral is a relatively strong ROI. So, is cold calling effective? Unfortunately, the answer to this question may still remain unanswered. 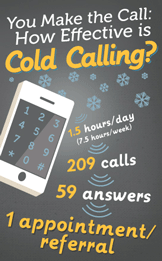 However, this first attempt to quantify the results of cold calling has very positive implications for agents. The data from the study reveal that with enough time and effort, cold calling can lead to a set of qualified appointments with prospective clients. The most tedious and undesirable aspects of telephone cold calling, though, include sifting through the no-answers and non-working numbers that exist on unqualified lists, and experiencing rejections from callees not interested in the offering or refusing additional information. To be effective at cold calling, agents must be aware of these realities - many calls placed to unqualified numbers will likely be quick contacts that yield no results. Additionally, we found that agents would often continue making calls when their efforts were more productive, and stopped calling when their efforts became less productive. Not all agents in our study completed the full number of cold calling hours requested each day. Maintaining motivation while cold calling, especially in anticipation of unsuccessful outcomes, is a challenge many agents are unwilling to face. An important outcome we found, though, is that once a contact is made the results are encouraging. One out of every 59 calls answered (30 out of 1774) resulted in either an appointment or referral. And, if we take into consideration those who requested the agents call back later (considered an interested response) we find one out of every 10-11 calls answered resulted in some type of interest. This figure is promising, particularly for a totally unqualified list. The data also reveal that there was clearly a significant difference in the time of day that calls were most productive. Mornings to early afternoon (10am - 2pm) were the most effective times of day to place the calls. During this time period, 31% of the calls were placed and resulted in 53% of all appointments/referrals generated. The least effective time for making calls was during the evening hours (after 5pm). During the study, this time period accounted for 42% of all calls made but resulted in only 21% of all appointments/referrals. How many calls can I realistically make in one hour? This is an important consideration for an agent to make - and the figure will vary from agent to agent. Cold calling can be tedious (both mentally and physically), but can lead to potentially fruitful outcomes. The quality of the cold calling list may also have an impact on how successful a set of cold calling activities will be. How many calls am I willing to make before securing an appointment or referral? The study reveals it took 330 calls to secure one appointment, and 209 calls to yield one appointment/referral. While the ROI story our data told was encouraging, the return each agent achieves will be different (depending on a number of factors). The ROI story serves as a baseline and a comparison that agents can begin to work with to shape cold calling practices. Are you willing to make 200-300 calls before securing an appointment or referral? How hard am I willing (and able) to work to reap the rewards of cold calling? Assuming a median home price of $154,700 (National Association of Realtors 2011) and an average commission rate of 3%, an agent can make an average of $4,641 on each sale of a home. An agent's hourly rate as a result of cold calling, then, is only determined by how many hours it takes to secure the sale. The cold calling debate is still contentious. Simply Googling "real estate cold calling" reveals a number of competing individual assessments on the effectiveness of the cold call. However, if enough agents have given up on the effectiveness of cold calling (as many agents suggest), agents willing to invest the time, energy and resources into cold calling have the potential to reap the benefits made available by other agents unwilling to do the same. Further research is necessary to validate the results of this study and to draw meaningful conclusions on the effectiveness of cold calling. Specifically, further studies should include agents from multiple agencies, and should include a representative sample of agents from across the U.S. and/or globally. A longitudinal study will also help researchers validate outcomes of further research, and will also help determine whether a number of variables (time of year, time of day, etc.) plays into the outcome and/or effectiveness of cold calling efforts. Anonymous (2011), "2011 NAR Profile of Home Buyers and Sellers," National Association of Realtors, (accessed June 25, 2012), [available at https://www.realtor.org/prodser.nsf/products/186-45-11?opendocument]. President, Nicksic-Lampertz & Associates, Inc.
Dale Lampertz is a Lecturer in Marketing at Baylor University's Hankamer School of Business. He also is President of Nicksic-Lampertz & Associates, Inc., a marketing and advertising firm located in Dallas, Texas. With over 40 years of experience in marketing and advertising, Lampertz brings experience and insight into the classroom at Baylor. He teaches a Marketing Research course and served as a liaison between Baylor University and Keller Williams Realty International for a fall 2011 Lead Generation Study and a spring 2012 Leverage Study.